Thought you might like to see some fish we caught Thurs 1/22/09 in red fish bay. Anglers are from left to right; Capt Dennis Lugg, Bud Baker, Capt Mike Odell, Norm Ellison, Rupert Ross, and Don Thompson. We caught these in Red Fish Bay. Josh Clark caught this 27" and 6.5lb Trout at Baffin Bay. Sweet! Guided by his buddy Captain John Little. Captain Little is also one of the Directors of the Corpus Christi Law Enforcement Fishing Tournament or CCLEFT. Below is a press release regarding the TPWD Coastal Fisheries Division proposals as presented to the commission last week. AUSTIN, Texas — Texas Parks and Wildlife Commissioners Wednesday approved several proposed changes to saltwater fishing regulations recommended by TPWD Coastal Fisheries Division staff. The changes include new regulations dealing with flounder, federal consistency issues for sharks and other species, and a paddle craft licensing and training program. Scoping of these issues has been ongoing since the fall of 2008. The Coastal Fisheries Division proposals are part of statewide proposed hunting and fishing regulation changes for the upcoming 2009-2010 season. The Texas Parks and Wildlife Department has set a record 46 public hearings across the state in February and March to explain the proposals and seek public input. Hearing dates and locations are on the 2009 TPWD Statewide Public Hearings Web page. After the regulations proposals are published in the Texas Register in early February, anyone may also comment online via the TPWD Opportunities for Comment Web page. The TPW Commission will make final decisions about proposed regulations at its March 25-26 meeting in Austin. Details about the possible regulation changes can be found below, and TPWD invites the public to weigh in on these possible proposals by clicking the public comments section on the TPWD home page. Flounder — As briefed at the August Commission meeting Coastal Fisheries biologists believe that long-term downward trends in the southern flounder fishery warrant consideration of proposed regulations that will reverse the downward trend in abundance. The proposal approved by the Commission for publication in the Texas Register includes a statewide closure for the month of November. Additionally, the proposal would change bag limits to five fish for recreational anglers and 30 fish for commercial anglers. Possession limits for flounder are the same as bag limits. Federal Consistency - Coastal Fisheries staff continue to look at several species managed jointly with the National Marine Fisheries Service and the Gulf of Mexico Fishery Management Council to become more consistent in terms of bag and size limits. Other Species — The proposed amendments include species that have been found to be in an overfished condition or undergoing overfishing. The proposed changes include: increasing the minimum size limit for greater amberjack from 32 inches to 34 inches TL, and establishing minimum size limits of 14 inches for gray triggerfish and 22 inches for gag. The bag limit for gray triggerfish would be 20 per person and for gag grouper it would be set at 2 per person with the possession limits being twice the daily bag limit. Paddle Craft Licensing — A proposal to consider a change that would allow paddle craft operators to receive a saltwater guide license by establishing a different set of requirements other than a United States Coast Guard (USCG) Operator of an Uninspected Passenger Vessel license. The USCG license current requirements may fail to address the unique safety issues associated with paddle craft and also may be restricting the licensing of paddle craft guides due to the "sea time" requirement. The proposal will create a paddle craft guide license and in order to receive the license the guide will have to show certification or proof of completion of a TPWD boater safety course and CPR/First Aid training, and completion of the American Canoe Association "Level II Essentials of Kayak Touring" and "Coastal Kayak Trip Leading" courses or British Canoe Union "Three Star Sea Kayak" and "Four Star Leader Sea Kayak" courses. We had a great time at the Corpus Christi Boat Show this last weekend. There were a lot of nice looking water craft and vessels to see and kick the tires. Fishing boats sure has come a long way in the last 10-20 years. Working in the SEA booth was a lot of fun selling raffle tickets to win a very nice fishin boat. Saltwater-fisheries Enhancement Association does a lot to support our fisheries locally. That means the funds they raise stay right here in are area. They had a terrific weekend and area appreciative of the support from the community. You should also consider joining the association. We had several people give advice on the best boat and accessories to get for best fishing. We are certainly thankful to your emails and comments. I was surprised not to see the Mosca, Majek boats at the show boat was able to see several others that might fit our fishin needs. I was able to visit with every boat dealer for fishing in the Laguna Madre over the weekend and found several boats that we liked. I was looking for a 22' long boat w/at least a 200hp outboard. The Haynie is a nice boat but I was looking for a double hull or liner that added appeal and comfort. The Ranger & Nortic Star were possibilities because of there appeal, accessories to enhance your fishin. The Skeeter 22' seemed like a real possibility sporting the only tunnel hull in it's class. Typically known for there bass boats they have another class of boat that run in saltwater. We made arrangements to test drive on Saturday and it did perform very well in choppy waters. We tested the set-up for trolling and also perform very well. Looked at the Skout's and they seem to have the most room on the boat for fishing. I had a chance to visit with Huff himself! Wow, what a pleasure to meet a guy who use to race when he was younger and fishin his whole life. The story's he can tell and share with us I bet are great! He's 93 years old now and still supporting his daughter in the boat business. What a treasure Corpus Christi has in Huff. Checked out a Blue Wave and it was probably in the top 3 on my list of possibilities. I liked the trim appeal and accessories and the back fold-out seating. The Blazer Bay was a very nice looking boat that seemed to fit a lot of what we were looking for with a lot a accessories and a 4 stroke 250 Susuki. Though it didn't have a tunnel hull, it certainly sports a nice motor with trim tabs and other features on the boat. The team at Ron Hoover seem to be more prepared to answer questions and deal. After you get through all the fluff of comparing boats this time around it came down to 2 boats. We like the Skeeter & the Blazer Bay. At this time its simply whether or not we can make a deal. I haven't test driven the Blazer Bay yet which may happen soon. Even if we are not able to work a deal out at this time we certainly learned a lot about boats this past weekend. What a terrific venue to maximize the consumer's time and have most of the boat dealers all at one place where we get to shop and compare. There's no right or wrong answer to which is the best boat. It's which is the best boat for you and your family. We hope that you enjoy JustGoFishin.com and information we provide in several different categories. Hope your new year is starting off the way you wanted. This month seems to be flying by very fast. Thought I would let you know that I'll be at the Corpus Christi Boat show this weekend taking a look at what's available in boats. The choices we have today for fishing the Texas Coastal Bend is amazing! What kind of boat should I get? A Haynie... A Mosca... or Mejak? or one of the several other brands available. Recently I picked up a Kayak at Jerry B's and equipped it for fishing. Took it out for a test drive and it was great! My biggest concern for buying a kayak was having a Kayak with the closest thing to a Lazy Boy for a seat placed in it for comfort. Since I'm older in age comfort is more important to me. I'm looking forward to Joining the Third Coast Kayak Fishing Series this February. They put on a great Kayak fishing tournament. Kayak's are such a personal water craft that it really needs to fit your your personality and meet your needs for fishing or recreation. Jerry B's really can get you set up right! Again, Looking forward to seeing what's available! Today I'll be at the SEA booth helping them sell raffle tickets & SEA memberships. (Some Lucky Person is going to win a new fishing boat) This is a really great organization that enhances our local fisheries! Hope you'll stop by! Also, coming up is the Baffin Bay Rodeo! $10,000 1st place prize. 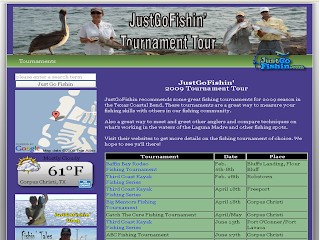 JustGoFishin' has just launched our 2009 Fishing Tournament Tour! Check-out the several fishing tournaments that should be on your calendar to participate!. JustGoFishin.com has created a list of fishing tournaments that we recommend you sign up and test your angling skills with your local peers. Stop by for updates & fishing tournament photos. See who are the defending Champions from last year.